Having a sister who is also a school librarian has lots of obvious perks. Every time we get together is like a mini professional development session as we talk books, technology, lesson ideas, and effective teaching practices. We get together a lot! Another benefit is that she teaches in Rhode Island and belongs to Rhode Island Society of Technology Educators (RISTE). 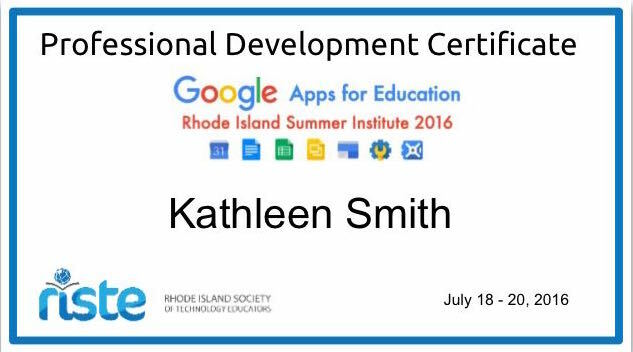 This summer they offered a 3-day Google Apps for Education Summit (#RIGAFE2016) that I was fortunate enough to attend with her. 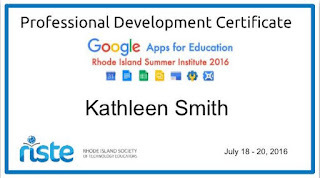 The school district where I work will be a Google Apps for Education and Google Classroom school district this year so I was very excited to start learning more. This was by far one of the best professional developments I have ever attended. The instructors were educators who work in flipped classrooms. Twelve breakout sessions were offered each day that did not just gloss over a topic but showed how it worked and can be implemented in the classroom. The challenge for me sitting in the breakout sessions, is that I knew exactly what teachers, what projects and what curriculum topics I would want to suggest flipping...but those were the elementary teachers I have worked with for almost two decades. Working with two new staffs and entirely new curriculums will be an interesting learning experience that I am very much looking forward too as I get to work with my former students. Now that the summit is over, I am exploring more on my own. I will share the apps, extensions, add-ons that I find helpful in this blog. It is a very exciting time to be in education as more technology is implemented, allowing us to teach, guide, share, and collaborate. Ultimately, preparing our students for future educational and professional endeavors. Hip Hip Hooray...for books YA!! !